You only need an appointment for Bridal. Everything else just call into us! 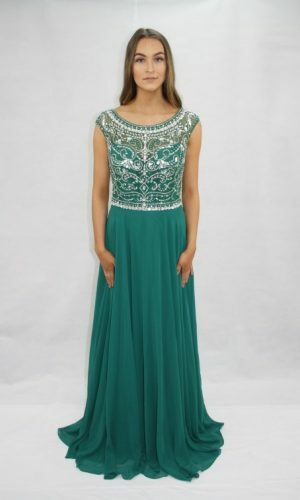 Colours Available: Green Our website showcases just a small amount of our Debs Dresses available. Call into us in Blarney Business Park to view the full collection. 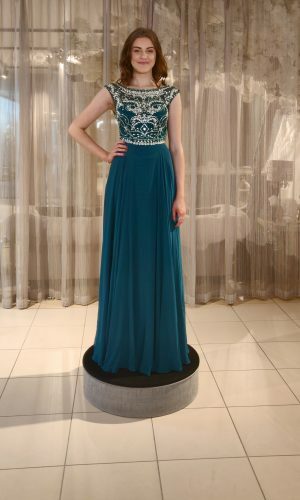 Our website showcases just a small amount of our Debs Dresses available. Call into us in Blarney Business Park to view the full collection. Show-stopping Mori Lee A-line dress 42009 is sure to make a fashion statement. 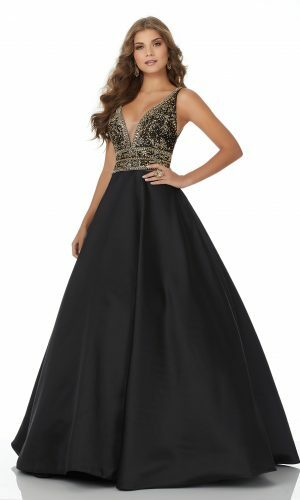 This strapless sweetheart neckline has elegant tone-on-tone bead work throughout the bodice as a full A-line skirt features an eye-catching striped printed skirt. Our website showcases just a small amount of dresses available. Call into our store to view the full collection. There is no appointment needed. 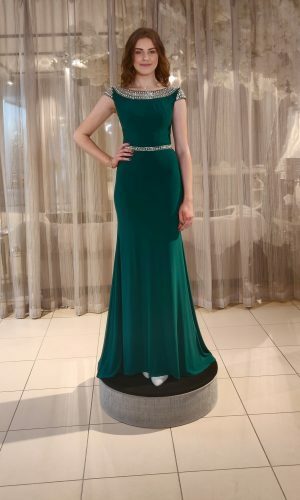 Sleek Charmeuse Two-Piece Prom Dress Featuring a Fully Beaded High Neck, and Racer Back Bodice. A High Side Slit Completes the Look of the Flowy Wrap Style Skirt. Have all eyes on you in this glamorous yet fun Mori Lee two-piece dress 42015. The fully embellished crop top sparkles from afar for added drama. 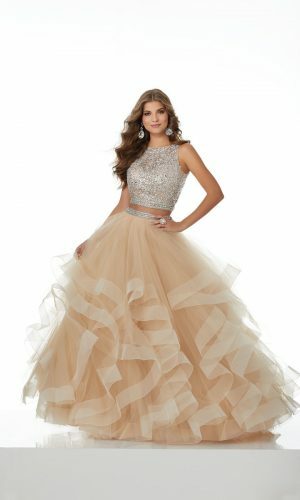 The full skirt cinches your waistline with a beaded belt as a tiered tulle skirt creates flattering ruffles with a horsehair lining. Form Fitting Jersey Prom Dress Featuring a Beaded, Deep-V Neckline and Sheer Back. A Beaded, Sheer Net Train Completes the Look. 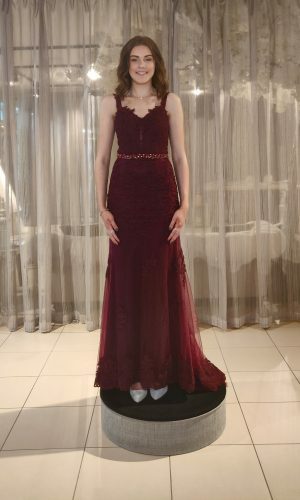 Colours Available: Burgundy Our website showcases just a small amount of our Debs Dresses available. Call into us in Blarney Business Park to view the full collection. 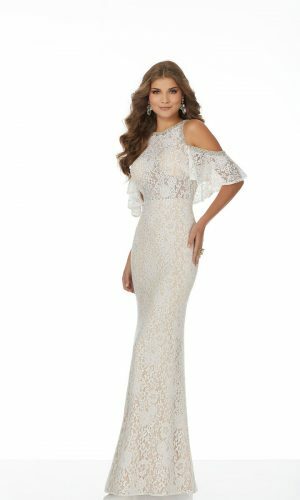 Glamorous Mermaid Gown Featuring a Sheer, Boned Bodice Accented in Beaded Lace Appliqués. A Delicate Lace-Up Back Completes the Look. 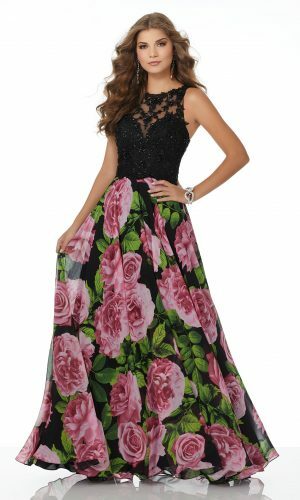 Have fun in floral at the debs in this beautiful Mori Lee dress 42016. 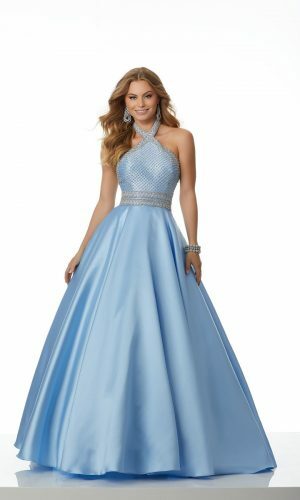 Scattered stones and applique decorate the fitted bodice, giving you an elegant sparkle, as a floral skirt gives you the perfect pop of colour. Gorgeous Lace Party Dress Featuring a Unique Beaded Patern and Keyhole Racer Back. 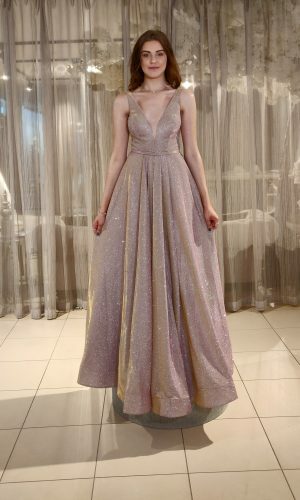 Colours Available: Burgandy Our website showcases just a small amount of our Debs Dresses available. Call into us in Blarney Business Park to view the full collection. 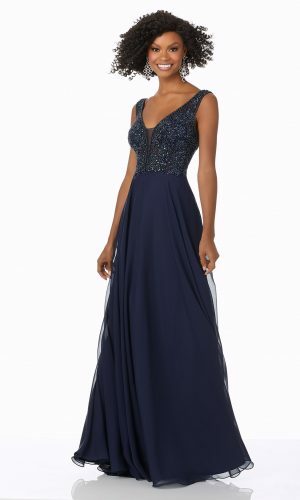 Step out into prom in this magnificent Mori Lee mermaid dress 42002. This slim-fitting silhouette accentuates your figure as you enjoy your special night, as a halter neckline pairs elegantly with the keyhole open back. 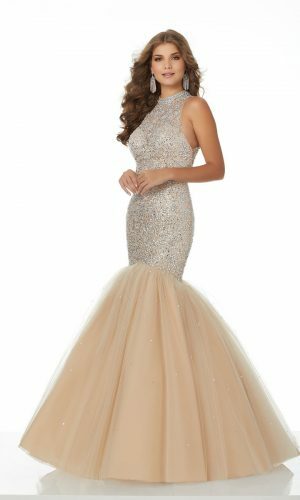 Sequins and crystals drench the entirety of the dress as a tulle mermaid bottom features scattered sequins. Colour Available: Pink Blue Our website showcases just a small amount of our Debs Dresses available. Call into us in Blarney Business Park to view the full collection. Be classy and romantic in this Beaded Net Debs/Evening Dress with Deep-V Neckline and Open Back. Zipper Back Closure and Sweep Train. Available in Latte, Red and Charcoal. Our website showcases just a small amount of dresses available. Call into our store to view the full collection. 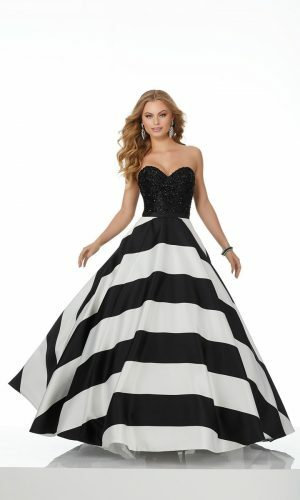 There is no appointment needed for Debs dresses. Just call into us. Larissa Satin Debs/Evening Dress with Beaded Lace Bodice and Racer Back. Zipper Back Closure. Colours Available to order: Wine Berry, Black Our website showcases just a small selection of dresses available. Call into us to view the full collection. 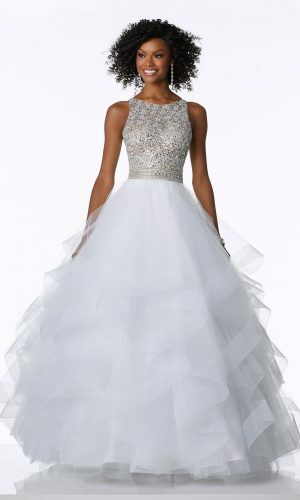 Feel like a goddess as you step into the room in this stunning Mori Lee dress 42019. A plunging V-cut neckline is featured along the tone-on-tone beaded bodice. A scoop back and flowing chiffon skirt gives you the perfect elegant touch for your ensemble. 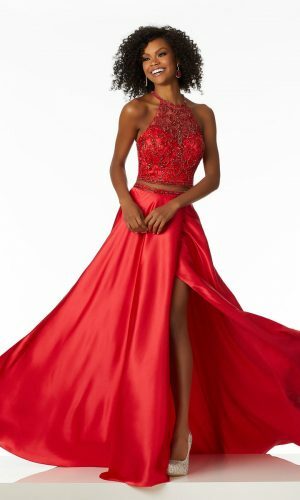 Sleek Prom Gown Featuring a Flowy Charmeuse Skirt and Fully Beaded Halter Neckline Bodice. Our experienced staff will help you find the perfect dress for your special day. Give us a call, drop us an email or call in to get in touch with us.